SHANGHAI, June 30, 2018 /PRNewswire/ — The artificial intelligence industry in China has become one of the hottest and fastest growing sectors, with large public companies and startups alike competing for the burgeoning market, as well as venture capital and private equity. China is poised to become one of the world leaders, if not the leader, based on a combination of progress, ambition, and government as well as large conglomerate support. Chinese investments account for 48 percent global AI startup funding market and for current patents has surpassed the United States by a large margin. China Internet Weekly, the analytical and editorial entity of China Academy of Sciences (state-backed national scientific think tank and academic governing body) and one of the leading technology publications, on an annual basis publishes a ranking of the top 100 companies in each technology subsector including big data, AI, healthcare technology, and financial technology. The criteria for selection and ranking on these lists include factors such as revenue growth rate, brand reputation, level of innovation, and judge panel scoring. The 2018 Top 100 List have just been published for Artificial Intelligence – and large technology conglomerate and emerging AI technology companies have been ranked alike. 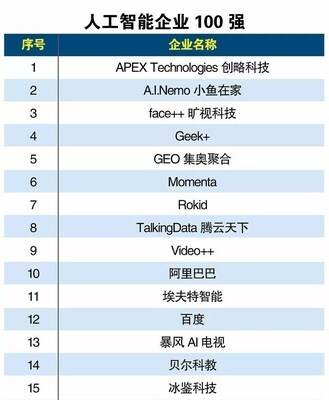 Some interesting additions to top 20 include Face++, one of the fastest growing machine vision companies, and AI Nemo, which is Baidu’s smart home AI branch and effectively the Amazon Alexa of China. Others in the top 50 include the usual large tech conglomerates including Baidu, Alibaba, and Tencent, and Huawei. The most notable addition to the top 10 is the #1 ranked company on this year’s list, APEX Technologies, a fast growing data technology company focused on AI and blockchain technology. APEX Technologies builds data and artificial intelligence solutions for mid to large size corporation to help with marketing, CRM, customer experience, and data-driven insight – simply put, using AI to increase revenue and the bottom line. APEX Technologies boasts an enterprise customer list with some of the most prominent Fortune 500 companies, brands, as well as top internet companies, including the likes of Lenovo, Didi (China’s Uber), Hilton, DBS, Mont Blanc, Volvo, MacLaren, and Wanda Group. APEX Technologies’ AI technology mainly consists of predictive insights and natural language processing (NLP) using proprietary deep learning technology, and is able to deliver a level of customization for large customers. The management team mentioned that the top priority within their strategy is rapid enterprise adoption as a result flexible solutions. APEX Technologies boasts an addition of roughly 100 new large enterprise customers in the past year alone, and the company doesn’t see that slowing down. “Our solutions can cost anywhere from a couple hundred grand for your standardized SaaS solution to a couple million for a large enterprise deployment with 50 servers. But the key is you can always start cheap and quick, and the goal is you will see the value and take the cooperation to the next level. That would be the similar logic for our data, AI, or blockchain solutions. We got a lot to offer, and customers are delighted for the most part.”, said APEX Technologies VP of Commercial Larry Fang. “We’re just getting started.”, added APEX Technologies Founder & CEO Jimmy Hu. IRVINE, Calif., June 29, 2018 /PRNewswire/ — SetSchedule, a leading real estate data analytics company, announced the 1.5 version of its proprietary real estate professional business development application. SetSchedule combines the latest innovation in data and artificial intelligence to deliver reliable insight and qualified leads directly to real estate professionals. Improved on-demand push notifications—using real time data and insights to give real estate agents quicker awareness of home shoppers entering the market, that are a match to their skills, expertise and personality. Using SetSchedule, real estate professionals can gain competitive advantage and harness more new opportunities, faster. Revamped CRM system—the enhanced system intuitively handles practice management from lead intake through listing. The linear system was designed according to agent preferences, to help them more efficiently qualify and manage leads. SetSchedule’s multi-patented process leverages AI-powered predictive data, insider market insights and automated marketing software tools to match home buyers and sellers with the real estate professional who can best meet their needs. Through the professional application, agents quickly receive the right opportunities, calendar appointments and valuable insights they need to close the deal. For more information about SetSchedule’s innovative solutions, please visit www.setschedule.com. SetSchedule is a first-of-its-kind technology-based real estate marketing firm that connects Realtors® with local homeowners, home buyers, and investors who are seeking to buy and sell properties. The company identifies potential sale properties before they even reach the market with its innovative, multi-patented matching engine that leverages AI-powered predictive data, insider market insights and automated marketing software tools. Founded in 2014, SetSchedule is based in Irvine, California. Learn more at setschedule.com. WASHINGTON, June 29, 2018 /PRNewswire-USNewswire/ — Experiments investigating cellular biology, Earth science and artificial intelligence are among the research heading to the International Space Station following Friday’s launch of a NASA-contracted SpaceX Dragon spacecraft at 5:42 a.m. EDT. SAN FRANCISCO, June 29, 2018 /PRNewswire-USNewswire/ — The Linux Foundation, the nonprofit organization enabling mass innovation through open source, announced the addition of 32 Silver members and 3 Associate members. Linux Foundation members help support development of the shared technology resources, while accelerating their own innovation through open source leadership and participation. Linux Foundation member contributions help provide the infrastructure and resources that enable the world’s largest open collaboration communities. In addition to joining the Foundation, many of the new members have joined Linux Foundation projects like Automotive Grade Linux, Cloud Native Computing Foundation, LF Deep Learning, EdgeX Foundry, Hyperledger, LF Networking, OpenHPC and Open Mainframe Project. For a full list of members, visit https://www.linuxfoundation.org/membership/members/. Abalta Technologies is a leading provider of technology and infotainment solutions for the global connected car market. Airbiquity is a leader in vehicle telematics, geofencing, and connected car systems, with more than 7 million connected vehicles on the road. Beike Finance is the leading residential property financial services provider in China. BGI Shenzhen Co., known as Beijing Genomics Institute prior to 2008, is one of the world’s genome sequencing centers, headquartered in Shenzhen. BlackRidge Technology develops, markets and supports a family of products that provide a next generation cyber security solution for protecting enterprise networks and cloud services. Blockdaemon is a Nodes as a Service platform that empowers businesses to simply and efficiently manage blockchain applications. CircleCI is a continuous integration and continuous delivery platform that helps teams work smarter, faster. DiDi is the world’s leading one-stop mobile transportation platform, offering a full range of app-based mobility options for over 450 million users. eBaoTech International‘s mission is “make insurance easy” – pioneering the 3G insurance tech, or Java based core insurance system, eBaoTech is moving to the 4G insurance technology which is cloud native and microservices based. Edgewise Networks is the industry’s first Zero Trust platform for hybrid cloud security – stopping attackers’ lateral movements and protecting workloads by allowing only verified applications, users, containers, and hosts to communicate. Elastisys provides products and services in the realm of Kubernetes and automation – enabling intelligent autopiloting for IT operations, increased performance, and availability of applications, all based on world renowned cloud research. EPAM Systems provider of digital platform engineering and software development services. Evernym, Inc. develops software solutions that leverage distributed ledger technology to provide every individual, organization and connected device with secure and irrevocable identity. Experian is a consumer credit reporting agency. Integrated Computer Solutions, Inc is a full-service information technology and IT security consulting and professional services firm. IOWNIT is a technology-driven investment platform built for investors, entrepreneurs, and their trusted advisors to invest, trade and raise capital in private markets. Kakaopay is a mobile payment and digital wallet service by Kakao based in South Korea that allows users make mobile payments and online transactions. Kyra Solutions Inc has emerged as one of the leading information technology service providers in the State of Florida. Neusoft Corporation provides innovative information technology – enabled solutions and services to meet the demands arising from social transformation, to shape new life styles for individuals and to create values for the society. NuCypher enables seamless and secure sharing of sensitive data between organizations as well as allows enterprises to securely use cloud service providers. Octarine delivers total visibility, easy policy management, and strong app security with seamless integration with systems such as Kubernetes, Istio, and Kafka to reduce security threats, obtain compliance, and achieve simple, secure multi/hybrid-cloud. Omnitude is a project to revolutionise connectivity between blockchain technologies and enterprise systems. Optherium Labs is a global research and development organization building a new standard and synergy of blockchain solutions using an open source, collaborative software development approach. Ping An Technology (Shenzhen) Co. Ltd is the technology incubator for Ping An Group, with strong research and development capabilities in cloud, artificial intelligence, and big data technologies – is headquartered in Shenzhen and has branches in Beijing, Shanghai, Chengdu, and Nanjing. Rocket Software helps companies around the world solve their most challenging business problems by helping them run their critical infrastructure, business processes, and data. RTE (Reseau D Transport d’Electricite) is the French electricity transmission system operator responsible for operating, maintaining and developing the high and extra high voltage network. Safewrd Ventures OU aims to enable and train companies to use open source and cloud technologies to release new software faster. Shenzhen Ultrachain Technologies is a leading blockchain technology solutions provider. Sitech Electric Automobile Industrial Co., Ltd. is a supplier of electric mobility products and services. Sprint Corporation is a communications company offering a comprehensive range of wireless and wireline communications products and services that are designed to meet the needs of consumers, businesses, government subscribers and resellers. Thinkarchitecture AG supports software architects and developers in the critical phases of their projects. Budapest University of Technology & Economics is the most significant University of Technology in Hungary and is considered the world’s oldest Institute of Technology which has university rank and structure. The New Mexico Consortium (NMC) is a non-profit corporation that was created in 2006 by the University of New Mexico (UNM), New Mexico State University (NMSU), and New Mexico Institute of Mining and Technology (NM Tech) in partnership with Los Alamos National Laboratory (LANL) to advance statewide collaboration in science research and promote collaboration. RedBite Solutions has secured Innovate UK funding for £1 million project to transform its asset tracking software ‘itemit’. Fueled by transparency and openness, itemit will leverage advanced AI and machine learning algorithms to create a social network-style approach to asset management. Recent, tragic, events in social housing have highlighted the need for change in the way assets that are owned, managed and used by different parties are monitored and maintained. Asset end-users, such as housing tenants should have access to up-to-date and accurate information on asset maintenance and inspection schedules. All relevant feedback, reports and concerns from end-users should be valued and used to enhance and inform asset management decision-making. “The Grenfell Tower tragedy highlights the need for a drastic change in the way assets that are owned, managed and used by different parties are maintained and monitored. As evidenced in the Tower’s fire risk assessment report (Nov, 2012), the condition of critical assets was directly linked to the extent of the tragedy. Our aim is to empower members of our society at a very poignant time to engage with a transparent and trustworthy change that addresses pertinent concerns that are shared by so many,” said RedBite Solutions CEO, Dr. Alex Wong. “The output from this project is an innovative, digital platform for all asset stakeholders that incorporates new algorithms developed together with CUED. Two public reference sites, in the social housing and university markets, will be created by the project. These combined innovations are disruptive in that, for the first time in the infrastructure industry, users are given the opportunity to provide actionable input to asset managers,” said Dr Ajith Parlikad, Senior Lecturer in Industrial Systems at the Institute for Manufacturing (IfM) and CSIC Investigator. In line with the Horizons’ Human-Rights priority area, people must have the freedom to participate in decision-making that affects their lives. This project will extend RedBite’s fully-owned product, itemit to create an innovative digital platform for stakeholders to interact with assets and revolutionise the way asset data is conveyed and analysed. SHENZHEN, China, June 29, 2018 /PRNewswire/ — LexinFintech Holdings Ltd. (“Lexin” or the “Company”) (Nasdaq: LX), a leading online consumer finance platform for educated young adults in China, announced that Fenqile, its e-commerce-driven installment finance platform, is teaming up with Burger King in a joint marketing campaign as part of its efforts to expand the use of installment payments. The campaign, driven by a mutual focus to serve the young generation between Fenqile and Burger King, includes a stored value card worth RMB390, which can be bought with a discount of 28 percent and be used for food and beverage purchases at more than 800 Burger King stores across China from June 25 to September 25. The card, tailored exclusively for the campaign, is sold on Fenqile and customers can choose to pay for it with credit from different installment plans. The cooperation is the first time that Burger King, one of the largest fast food hamburger chains in the world, has teamed up with a Chinese consumer finance company, as it explores new ways to engage customers and seeks to tap the huge potential from rising consumption fueled by the use of installment payments among China’s young people. It also marks Fenqile’s latest initiative to expand the use of installment payments from online to brick-and-mortar stores, to better serve its customers, who are primarily educated young adults in China. Fenqile began as a platform selling computers, smartphones and other consumer electronics, and has been increasing offerings by adding additional product categories to meet the growing needs of its customers. Customers can now buy a wide range of products on Fenqile, from cosmetics and personal care to plane and train tickets. The use of installment payments is on the rise in China, and will continue to grow in the next few years, as an increasingly large number of young people are gaining credit to improve their quality of life. Along with the expansion of consumer credit, the concept of making purchases on an installment basis is increasingly seen not just as a way to satisfy an urgent need, but also as a normal method of shopping, according to a January report published by Lexin with support from its e-commerce partners including Apple, Dell, L’Oreal, and P&G. Installment payments usage is shifting from a low-frequency form of consumption to a high-frequency form of routine consumption. The annual average number of orders per user paid for by installments on Fenqile has increased in the past three years, to 11.2 in 2017, from 10.6 in 2016, and 7.2 in 2015. Increasingly, installment payments are shifting from the one-off purchase of bigger ticket items, to smaller purchases. The use of Installments are no longer limited to more costly consumer goods, such as computers and smartphones, but are increasingly involved in all aspects of life, such as travel and catering. The joint campaign is supported by Lexin’s Hawkeye risk management engine, which will be in place to assess new customers’ creditworthiness. LexinFintech Holdings Ltd. (“Lexin” or the “Company”) is a leading online consumer finance platform for educated young adults in China. As one of China’s leading financial technology companies, Lexin integrates its e-commerce-driven online consumer finance platform, Fenqile, with advanced risk management technologies, the Company’s Dingsheng asset distribution and fund matching technology platform, and the Company’s Juzi Licai online investment platform for individual investors, to create a comprehensive consumer finance ecosystem. The Company utilizes technologies including big data, cloud computing and artificial intelligence to enable the near-instantaneous matching of user funding requests with offers from the Company’s more than 30 funding partners, which include commercial banks, consumer finance companies, and other licensed financial institutions. By serving the credit needs of China’s educated young adults, Lexin helps its more than 20 million registered users to enjoy a better quality of life through the use of better credit. For more information, please visit: http://ir.lexinfintech.com. NEW YORK, June 29, 2018 /PRNewswire/ — Fusemachine Inc., a leading provider of AI solutions, software and educational services announces the acquisition of Rake Inc, a talent acquisition and candidate engagement platform that services candidates and employers by providing an array of tools leading to better experiences and outcomes throughout the recruitment process. Rake has developed technology and IP in talent acquisition that helps employers capture and engage candidates who visit their career website while providing a better candidate experience. The Rake platform also consists of a web and mobile app that allows candidates to manage their entire job search all in one place. Fusemachines plans to expand on the technology and expertise of Rake for improving its AI talent pipeline and its AI as a Service offering. “The team at Rake are experts in talent acquisition technologies as well as online education. Such experience is vital in the growth of Fusemachines, specifically for our education, training and the delivery of AI talent and solution services,” says Sameer Maskey, Founder & CEO of Fusemachines. Rake’s team comes with a lot of experience in Human Capital Management and Education industries. Rake’s CEO, Michael Iacona, has led and grown online education companies like the IIN and has worked extensively in HR technology for companies such as Monster Worldwide and TMP Worldwide, where his team led the development and launch of TalentBrew, a category leader for Fortune 500 companies in the talent technology space. The executive team of Rake will be joining Fusemachines with Rake’s CEO, Mr. Iacona, joining Fusemachines as the Chief Strategy and Growth Officer, working closely with clients to incorporate the best ways to leverage AI in their business, while positioning Fusemachines as a leading provider for AI solutions, software and education. Fusemachines seeks to be a leader in AI education and talent space. Fusemachines sources and grooms AI talent in developing countries and underserved neighborhoods using its proprietary learning and testing platform. Fusemachines connects these groomed AI engineers to companies seeking AI talent. Founded in 2013, Fusemachines Inc. is a pioneer in the field of Machine Learning and Artificial Intelligence. Fueled by the research of its Founder/CEO Sameer Maskey (an Adjunct Professor at Columbia University teaching Deep Learning and AI for Business), Fusemachines’ mission is to put AI in everyone’s hands through education, software & services. The company has successfully provided its products and services to a myriad of industries, helping companies solve real-world problems through the use of AI innovations. According to a new market research report “IoT for Public Safety Market by Component (Platform, Solution, and Services), Application (Emergency Communication & Incident Management, Surveillance & Security, and Disaster Management), Vertical Market, and Region – Global Forecast to 2023″, published by MarketsandMarkets™, the global market size is expected to grow from USD 979.0 million in 2018 to USD 2,045.0 million by 2023, at a Compound Annual Growth Rate (CAGR) of 15.9% during the forecast period. The major driving factors of the IoT for Public Safety Market are the rise in increasing national security and public safety threats and growing number of smart city projects driving the critical need for reliable public safety solutions and services. In addition, increasing adoption of Machine Learning (ML) and Artificial Intelligence (AI)-based public safety solutions drive the market. Disaster management helps government institutes and public safety organizations in identifying threats and preparing for emergencies. It helps prepare for a disruptive event, such as fire, tornado, hurricane, flood, or a power outage or even a man-made disaster to safeguard citizens in case of emergencies. The quick response, disaster recovery, and simulation are a part of disaster management. IoT leverages the data collected from physical environments including smart devices, analyzes the data, and provides results based on the data to the public safety departments for responding immediately and respectively in emergency situations. The system integration services segment is expected to hold a larger market size in the IoT for Public Safety Market during the forecast period. System integration is one of the important steps in enabling public safety agencies and allied organizations to adopt newer technologies for making the environment safe and secure. These services enable public organizations to integrate their operational setup including smart surveillance devices for providing a transparent and secured public safety environment to citizens for safeguarding them from physical and natural emergencies. These service providers help organizations develop a connected environment by integrating IoT devices and solutions with their existing IT infrastructure. North America is projected to hold the largest market size and continue to dominate the global IoT for Public Safety Market during the forecast period. The region’s increasingly adopting emerging technologies, such as IoT, smart cities, and mobility, is expected to boost the growth of IoT for Public Safety Market in North America. Furthermore, the growing concerns over protecting the critical infrastructure and sensitive data have increased the government intervention in the recent years. It, in turn, is expected to contribute to the overall growth of the IoT for Public Safety Market in North America. Major players in the IoT for Public Safety Market include IBM (US), Hitachi Vantara (US), NEC (Japan), Microsoft (US), Cisco Systems (US), Nokia Networks (Finland), Sierra Wireless (Canada), Telit (UK), and West Corporation (US). The other players include ThroughTek (Taiwan), Iskratel (Slovenia), IntelliVision (US), Star Controls (US), Carbyne (Israel), Securens (India), SmartCone Technologies (Canada), Kova Corporation (US), Esri (US), Cradlepoint (US), Endeavour Technology (Ireland), X-Systems (Netherlands), Yardarm Technologies (US), Tibbo Systems (Taiwan), CityShob, and SayVu Technologies (Israel). DUBLIN, June 29, 2018 /PRNewswire/ — You know the old saying, don’t judge a book by its cover? My parents used to tell me that all the time. Growing up the son of an engineer, I got firsthand teaching of how seemingly simple tools and parts – when architected in the right way – could be used to create extraordinarily complex products. I can now teach my three boys about the very same thing in the form of smart vehicle architecture. I can show them how wires, circuits and connectors can create the nervous system of the most complex computer with which you interact – a car. On the surface, these components might not appear high tech, but these are the components that will enable the future of mobility. And I don’t just mean the components. I mean the way Aptiv will design and create them, using state-of-the-art technology. We will increase our use of process and manufacturing automation to enable the full- fault tolerance and resiliency required to support functional safety requirements connected to autonomous driving. As critical vehicle safety functions become automated, the need for an absolutely reliable and fail-safe signal and power distribution system increases. That means we need to reduce any risks associated with the manufacturing and assembly processes through the use of new technologies. Additionally, high-speed data requirements will drive significant product and process technology innovation in order to achieve the needed performance and reliability. The data rates, expected to exceed 10 gigabits per second, will be required to enable both infotainment and driver assistance systems. How will we tackle these challenges? With new ways of thinking and by adopting new technologies in ways that might surprise you. You’ve probably seen many applications of 3D printing – including the recent announcements about using the technology for printing shoes. We plan to take it to a new level. We have been testing and using 3D printing for the manufacture of high performance connectors for some time now – working with a company called Carbon 3D. It has helped reduce waste, and increase efficiency and quality. In a joint project with Autodesk, we will expand the use of this technology to power and distribution systems by 3D printing entire wiring harnesses. We will also harness the power of software with the use of Artificial Intelligence (AI) and Augmented Reality (AR). People talk about AI in regards to software and algorithms to program and teach cars how to drive themselves. But we are taking it one step further and implementing AI into each stage of product and manufacturing design. We will use it in our operating system, helping us to build smart, integrated plants and processes. Finally, when you hear about AR – you probably think about video games, but we use the power of AR to revolutionize the way wiring harnesses will be manufactured. This will increase quality, efficiency and help create faster learning curves. The rate of change in the transportation industry is occurring at the fastest pace in history and it is only going to accelerate. Aptiv will stay ahead of this blistering pace, steadfast in our commitment to providing our customers with technology breakthroughs – not only for what we make, but how we make it. We will continue to research and develop new tools and methods to keep us ahead of the pace when it comes to not only innovating change – but delivering it. So, next time you come across a book with a seemingly innocuous cover – read it. It just may change the future. Glen De Vos is Aptiv’s chief technology officer and president, Mobility and Services Group. Aptiv is a global technology company that develops safer, greener and more connected solutions enabling the future of mobility. Headquartered in Dublin, Aptiv has 147,000 employees and operates 14 technical centers, as well as manufacturing sites and customer support centers in 45 countries. Visit aptiv.com. CARY, N.C., June 28, 2018 /PRNewswire/ — With competition fierce in financial services, banks of all sizes face common challenges. Each competes for customers in an evolving digital world, while simultaneously managing increased regulation and striving to be more operationally efficient. To respond to these industry challenges quickly and at scale, many banks are turning to analytical insights powered by the SAS® Platform and its SAS Viya products.